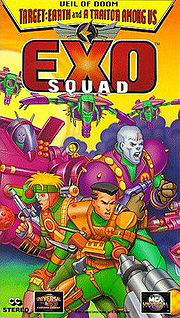 ExoSquad is set in the early 22nd century, and by that time humanity has made two major advancements. They have developed terraforming methods, which has made it possible for humans to inhabit not only Earth, but Venus and Mars as well. The second major achievement was in the field of genetic engineering, which enabled the creation of a new race, called Neo sapiens. This new race, since it was to be used as slave labor in the mines on Mars, was created to be physically superior to Homo sapiens (referred to as Terrans). A Neo sapien is stronger, larger, and can survive in harsher conditions that his human counterpart. A Neo sapien requires less food and no sleep. One feature denied to the Neo sapien race was the ability to procreate, thus the only way for a new Neo sapien to be created is in a brood chamber. Despite this shortcoming, some Neo sapiens resemble males, while others tend to be considered female. Mentally and psychologically Neo sapiens are similar to Terrans, for they are not any more intelligent and they do experience emotions (although they often seem tempered or dulled). Admiral Winfield was the commander of the entire Exofleet during the Neosapien War. A brilliant strategist and tactician, he was a man deeply respected and accorded (nearly) unquestionable authority. Even though his decisions at time seemed high-risk, his experience never failed him. The fact that he and J.T. Marsh were the only two people the Pirate Leader Jonas Simbacca truly respected as warriors speaks for itself. Yet, there were moments of weakness, as he failed to notice the fires of Mutiny growing on his ship and the fleet. Winfield's advanced age meant he was periodically indisposed due to illness and/or injury, an occurrence the incompetent Captain Marcus never failed to take full advantage of. Therefore, at the war's end, the Admiral retired from the Exofleet with full honors to build a horse ranch. Capt. Matthew Marcus (?) was the captain of Resolute during the first years of the war. As the war had been preceded by an unprecedented fifty-year peace that put the necessity of the Exofleet itself in dispute, he most likely gained his rank due to lack of competition during peace time. As one might expect, once the war began he quickly became infamous for his lack of strategic skills, his sheer arrogance and his hair-trigger temper. Disaster resulted almost immediately: he refused to accommodate the Exofleet's slower support units in an already suicidal attack on a Neosapien-held Earth. When J.T. Marsh challenged this decision, he had him charged with mutiny. Only heroic action on Marsh's part prevented the war from being lost almost before it began. As the war continued, his command was fraught with equally impressive failures of judgment. He eventually lost his life leading a mutiny against Admiral Winfield, destroying the Resolute and crippling the entire fleet in the process ? a wasteful end to an equally wasteful career (although he did manage to destroy a few Neosapien ships with the shockwave explosion caused by the Resolute's destruction), and ironic considering one of his first acts of the war was to charge another with mutiny. He was considered by many to be one of the most negative figures of the war, and certainly the most negative member of the Exofleet. Yet despite his obvious flaws, most of the Earth Fleet and crew still followed his commands and even agreed with him, as many were tired of the conflict and eager to end it. Despite it all, Admiral Winfield still felt sorrow for Marcus's senseless death and even going so far as to send one member of Exosquad out to rescue him. In the end, he still was obsessed in completing what he started and made a suicidal charge into Neosapian lines as a final attempt at glory. Just before his final charge, he did request that Admiral Winfield be told "Tell him that Matthew Marcus knew how to die!" Professor Algernon, formerly of the University of Chicago, was the head of the Research & Development Laboratories of the Exofleet. However, he had no real loyalty to the human government due to constant bureaucratic interference with his work. When the war began, he submitted to the authority of the Neosapiens with the condition that they freely fund his research. Under this agreement, he collaborated without protest even to the point of permitting others to take credit for his discoveries. As the "lab assistant" of the Neosapiens' leading scientist, Xenobius, he designed the so called GRAF (GRAvitation Focus) Shield, an ultimate defensive weapon capable of wiping out entire fleets approaching a planet. Algernon, being unconcerned with public recognition, was quite happy with the arrangement as it permitted him to work freely for the first time in his life. However, in his encounters with Able Squad he realized two things that troubled him greatly - first, that his "handler" Xenobius despised him for his superior skills in the sciences, and second, that his work was being used for the enslavement and murder of countless people. One is left to wonder which realization truly motivated his decision, but he then permitted himself to be extracted by the squad and worked for the Exofleet ever since. It was primarily due to his inventions that Terrans often had the upper hand battling Neosapiens. Even after the war, he continued to contribute his works, and was shown before the end of the series to have rebuilt Mars using another one of his inventions. 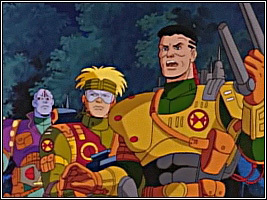 At the beginning of the Neosapien War, the Able Squad was merely one of many exosquads (E-frame squads) stationed on Resolute I as part of Flight 1. However, towards the end of the conflict, the Able Squad has become an elite unit assigned only to the most difficult missions (much like Rogue Squadron of Star Wars). The main story arc of the series primarily tells about the adventures of the Able Squad. Lt. / Wing Cmdr. J.T. Marsh (it is never revealed what his initials stand for) was the first leader of the Able Squad. In episode 2.23, he is promoted to the rank of Wing Commander and henceforth has two units under his command, Able and Baker Squads, while Lt. Nara Burns becomes the new leader of the former. Over the years, J.T. Marsh has proven himself as a man whom people will follow - even being the most famous and successful exosquad leader of the Exofleet, he remained a modest, attentive and likable person. In fact, the only one who has ever truly hated him was Phaeton, the leader of Neosapiens, - as well as the only one who was equal to him in hand-to-hand combat (except the Neo Lords), which clearly demonstrates Marsh's battle skills. One of his regular tactics in a space battle was to go for the enemy flagship, especially the well-defended bridge, thus, decapitating the opposing fleet. Over the time, Marsh has developed a mutual tender relationship with Colleen O'Reilly, a Lieutenant of the Jumptroop Platoon. As the series progressed, it was revealed that Marsh was at one time as rebellious and gung ho as Yuri Stavrogan and Kaz in his youth, the first episode alluded to this when he disobeyed orders and went on a joy run with his squad in the canyons on Mars. Clearly, fighting against the Neosapiens served to remind Marsh of his duties and the nature of war itself. During the war, Marsh piloted a "Falcon" #AA-500 E-frame. Voiced by Lisa Ann Beley. Lt. Nara Burns was, apparently, the youngest member and the second leader of the Able Squad. Her parents died in the Neosapien assault on Venus but her brother James survived to lead the Venus' resistance force. After her brother has been badly injured and killed during the liberation of the planet, the Able Squad became Nara's only remaining family. 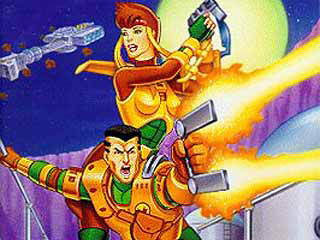 During a mission in the Amazon Rainforests, she was injected with an unknown mutating agent by Dr. Ketzer, but its effects haven't fully manifested themselves until the war's end, when she managed to temporarily seize control of Phaeton's movements, stopping him from activating his doomsday device, and after the war, when she accidentally rapidly accelerated the growth of a plant. Ironically enough, despite being the least experienced (albeit still talented) exotrooper, Nara Burns was the one to fire the last, and perhaps the most important, shot in the Neosapien War - the one that killed Phaeton, despite the fact that he was dying anyway. Over the years, she developed a deep relationship with Marsala; the final episode (meant to be the first of the third season) implies that she has fallen in love with him, although she also displayed an interest in the young pirate Hallas. Before her promotion, Burns shared with him a two-pilot #RA-678 E-frame, but later she applied for a #TB-024. Lt. Maggie Weston was the tech and repair specialist of the Able Squad. Her skills with machinery and weapons were comparable only to her resourcefulness - for example, she has been able to make any E-frame in any condition to fly again. In her personal affairs, however, Lt. Weston was not nearly as fortunate; in fact, she was often too shy to engage in romantic relations with men and was usually a loner. She did display a surrogate big sister type of bond towards Kaz Takagi at times though. For a long time, she had a secret crush on Alec DeLeon, but before she could bring herself to admit it, DeLeon has been killed in action (in his dying moments, he told Colleen O'Reilly to tell JT Marsh of her feelings for him, while noting in contrast "I never told Maggie...", which seems to confirm that he did in fact reciprocate Weston's feelings). It is suggested, however, that after his alleged resurrection by Professor Algernon, she has finally found some happiness. During the war, Weston piloted a #PO-024 Field Repair E-frame. Sgt. Rita Torres was the second in the chain of command of the Able Squad. Not much is known about her past, except that her boyfriend Glenn, whom she loved very deeply, broke up with her when she decided to join the Exofleet (but he wouldn't tell her why she had to choose between him and the Exofleet) and the fact that she hated the Pirate Clans. As the series progressed, it has been revealed, however, that she didn't hate them all indiscriminately but rather, she hated one specific pirate, Jubail, who killed her first squad and then left her to die in space. Overall, she was a perfect soldier - smart, skilled and always following the regulations to a word (as opposite to Wolf Bronsky's unorthodox stunts). It is said, that if soldiers could've been mass produced like the E-frames, Rita Torres would have been a standard model. Her E-frame of choice during the war was an #LD-029. Kaz Takagi was the second youngest member of the Able Squad. He has often been regarded as a rookie and a troublemaker, which is only half-true: he did cause a lot of trouble to his teammates, but never let them down in combat or otherwise. Kaz's E-frame, a #CR-001 Exofighter, was the only one in the squad that was incapable of ground combat, therefore he usually stayed in the air to provide aerial support and to scout the surroundings. A brilliant space pilot, Kaz Takagi deeply respected all fellow Able Squad members and especially regarded Wolf Bronsky as his mentor and his closest friend. He devoped a strong friendship and rivalry with fellow Exofleet pilot Yuri Stavrogan, though Marsh disproved of the friendship as he felt that Yuri encouraged Kaz's reckless behavior. Takagi cited his father's negative attitude towards him as being one of the prime factors that drove him to be the exceptional pilot that he became. After the end of the war, Wing Cmdr. Marsh sent him to the Exofleet Academy "to learn some discipline". Alec DeLeon was the intelligence and communication specialist of the Able Squad. Prior to his military career, he was a petty thief in France and joined Exofleet much like men used to join the French Foreign Legion. Despite this unhappy background, DeLeon is surprisingly cheerful and upbeat, with a lighthearted sense of humor that surfaces even in the worst situations. Known for his ability to foresee every danger miles ahead and to escape even the severest firefights without a scratch on his E-frame, DeLeon has been J.T. Marsh's right-hand man all the way until the day he sacrificed himself to let Exofleet take control over the Moon. Much later, after the end of the Neosapien War, Professor Algernon and Galba succeeded in creating a new physical body for him and implanting his personality (stored in his E-frame's flight data recorder that was heavily modified by Algernon before) into it. His new body was that of a Neo Mega, modified to appear Terran, and whether it has retained the infertility common to all Neosapiens remains open. He was known to flirt with Lt. Maggie Weston, who was secretly attracted to him but was too shy to admit it. Prior to his (first) death, DeLeon piloted a "Wraith" SLR-345 E-frame. Wolf Bronsky was the longest serving and therefore most experienced member of the Able Squad. His marksmanship and tactical skills were flawless, although his methods of achieving the set goals have been questioned often enough. Bronsky had a heart of gold and often patronized rookies in the squad, with the exception of Kaz Takagi, who was his closest friend, but he was also a slob who couldn't care less for etiquette and common rules, although towards the end of the war he became a little more disciplined. It was also revealed that despite his slovenly ways, he was quite well educated in the history of trains. His constant piggish acts often served as a source of humor throughout the series, notably, his belching would disgust characters and often did it during the most serious of times, thus breaking the seriousness of the matter. His belching was also notable for being able to make J.T. Marsh flinch, despite communicating with Bronsky through a remote viewing screen. During one of his missions on Earth, he fell in love with Eve Hanley, which soon has become mutual, she even encouraged him to take an interest in the arts. As the most experienced member of the Able Squad, Bronsky was especially fond of piloting one of the most dangerous and unstable E-frames of the Exofleet - a #BD-100. Marsala was the only Neosapien and the oldest individual in the Able Squad. In fact, he had been one of the leaders of the First Neosapien Revolt 50 years prior to the war and a close friend of Phaeton once, as they were created in the same brood, making them the Neosapien equivalent of brothers. In a flashback it is shown how Phaeton betrayed Marsala at the end of that conflict to save his own skin, thus ending their old friendship. This did set Marsala on a new path, and he swore an oath to serve the Exofleet after the first rebellion. Even though he had several chances to betray Exofleet during the second rebellion, he never did so and was marked a traitor to be killed on sight by the Neosapiens. In any case, Marsala still considered himself loyal to the Neosapiens as a species, and sought to work for their benefit at every turn. This attitude caused him to lead the First Rebellion, but also to oppose the Second, as he felt that the Neosapiens should not enslave the Terrans despite (or perhaps because of) the fact that they themselves were enslaved once. In addition to his skills as a pilot and soldier, Marsala has also shown to be a talented speaker and orator. This has probably helped him in the First Neosapien Revolt, as well as after the Neosapien War, when he put this skill to use in lobbying for the creation of a final brood of Neosapiens, one that was capable of sexual reproduction. Due to his origin, Marsala was often mistreated by Terrans (although never by members of his squad) but has always stayed calm and indifferent about it. He shared his two-pilot #RA-678 E-frame with Lt. Nara Burns to whom he developed a deep emotional attachment over the time. After Burns' promotion, Marsala continued to pilot his #RA-678 alone, and was eventually promoted to Lieutenant. Lt. Alice Noretti (?) was the first member of the Able Squad to be killed in action. Her landing pod was destroyed in a freak accident during the jump-landing in her first (and last) mission on Earth and her death left a painful scar on J.T. Marsh's soul. Neo Megas used her remains to create a clone of Alice (the same technology that was later used to resurrect Alec DeLeon) and programmed it to draw upon Lt. Marsh's survivor guilt and get close to him. The clone was then supposed to assassinate Admiral Winfield, thus reducing the morale of Exofleet, but the programming didn't work as expected and she committed suicide. Lt. Yuri Stavrogan (?) was one of the most skilled E-frame pilots of the Exofleet although he always lacked discipline and subordination. This quality often caused him trouble, so he was being constantly transferred from exosquad to exosquad but couldn't fit in anywhere. He was briefly a member of the Able Squad during the reconquest of Mercury, however, after he and Kaz Takagi, whom he befriended and began a playful rivalry of oneupmanship, defied their orders to chase the elusive Neosapien Thrax, Stavrogan has been reassigned once again. Stavrogan seemed to have some history with JT Marsh, with whom there was obvious tension; Stavrogan commented once that Marsh used to be as insubordinate as himself, and Marsh did not approve of Kaz's friendship with Stavrogan. Shortly before the liberation of Earth, he was promoted to an exosquad leader, commanding the Fox Squad of an unknown flight unit, but his entire team was wiped out during the first attack on the Neo Lord breeding facility in Antarctica. He barely survived that slaughter, emerging from the tragedy of losing Fox Squad a more humble, thoughtful man, and stuck with the Able Squad until his tragic death by the hands of General Shiva during the unsuccessful quest for Phaeton's doomsday device at the Great Slave Lake facility. By the end it appeared that he had finally learned the value of teamwork and discipline, making his death all the more unfortunate. Jumptroop Platoon played a crucial role in liberating the Homeworlds but until then, it wasn't shown in action very often in the series. The main purpose of the Platoon was securing the surface areas side by side with exosquads (e.g. the Able Squad), so it can be considered a sort of space infantry. Jumptroops were equipped with ultralight E-frames (more agile than the heavy units, but also more vulnerable, as they were incapable of carrying heavy weapons, armor or flight systems) and primarily deployed from orbital dropships via jump-pods (hence their title). Early in the Neosapien War, tensions could be observed between the E-frame pilots and Jumptroops (similar to conflicts between the Mobile Infantry and Fleet personnel in Starship Troopers, and rivalries between real U.S. military branches such as Army and Navy). Some E-frame pilots referred to them as "chump troops", viewing them as poor knockoffs unable to accomplish anything significant without E-frames backing them up. In turn, many Jumptroopers resented E-frame pilots, viewing them as arrogant fighter-jockeys with easier jobs and lower casualty rates. Many Jumptroopers had the opinion that the shortcomings of E-frame pilots were responsible for the high turnover rate of Jumptrooper battalions. In the series, the main focus is on the Charlie-Five (C5) Squadron led by Avery F. Butler and stationed on the jumpship Arnhem. Capt. Avery F. Butler was the first leader of the Charlie-Five Squadron of the Jumptroop Platoon. He was an expert in everything regarding battle and morale - weapons, E-frames, communications, even war cries. A perfect soldier and a great leader, he was to the Jumptroops what J.T. Marsh was to the exotroopers - when Butler spoke, Charlie-Five Squadron listened. Before any given jump-landing Butler would always line up his troopers and demand whether there are "any heroes" among them (the answer is always negative), clearly demonstrating his realistic views of war and combat. Avery Butler was severely injured during the liberation of Earth and Lt. Colleen O'Reilly had to take over the command. During the war, his E-frame of choice was an #AD-014. Following Phaeton's defeat, Butler was appointed the chief instructor at the Exofleet Academy. Lt. Colleen O'Reilly was Avery F. Butler's right hand man and the communications and tech specialist of the Charlie-Five Squadron. One of the best officers of the entire Exofleet, O'Reilly had a personal vendetta against Phaeton and his regime, since the day when nearly all her friends from the Exofleet Academy were killed in the first Neosapiens assault on Earth (it also was the day of her and their graduation). Over the time, she developed a tender relationship with J.T. Marsh but following Butler's incapacitation she was forced to assume the command over the squadron and to put all relationships aside for a while. During the war, O'Reilly used an #LS-042 E-frame. Lance Corporal Vince Pellegrino was the lead rifleman and a flamethrower expert of the Charlie-Five Squadron. It is also known that the Jumptroop Platoon was founded by Pellegrino's grandfather. Because of his exotic preference for flamethrowers, Pellegrino piloted a #JR-100 E-frame.